She just looks ABSOLUTELY thrilled that it is her birthday, as she should be! It was a fun day spent eating just treats, no regular dog food. That's how a birthday should be, right?! 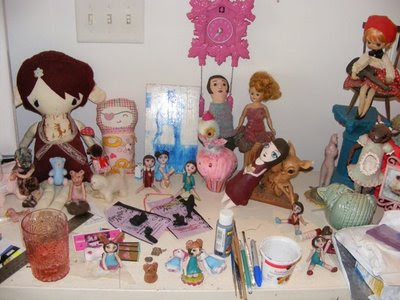 I dug some old goodies out of storage at my parents' house the other day, including three Blythes that I got for about $5 each (!!!) back in the early 90's when I was around 10 or 11. 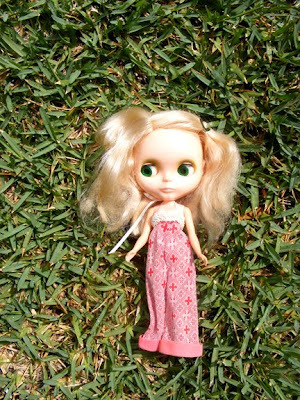 Blythes weren't popular then, but as soon as I saw one at a flea market, I had to had her. Here are some photos of one of them; I made the outfit for her around the same time as when I bought her out of some vintage barbie pants and trims. I've been working on a new multi-layered screenprint of a big-eyed girl with bear ears, but I need to figure out how to connect my old scanner/copier to my new computer. I think I will need to search my "random computer crap" drawer to find the software, sigh. Pictures soon, I hope! 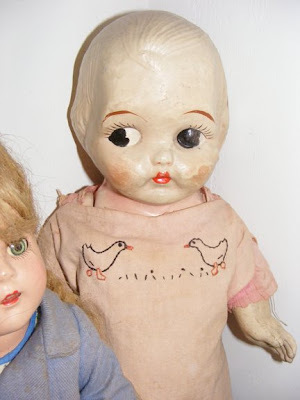 I'll leave you with one last photo of a doll I found online a while ago. 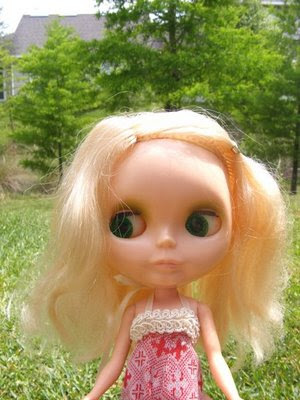 She, of course, has big eyes but is a lot older than the Blythe dolls. She is a composition doll from around the 1920's or so, and I got her on eBay for under $10 including shipping a few years ago! They didn't mention any dimensions in the auction description, so I assumed she would be about 8" tall - she came in the mail in a huge box and turned out to be 2 feet tall! Awesome! She also arrived in this hand embroidered outfit, cutest thing ever. I really enjoyed your blog! It was interesting & fun to read! 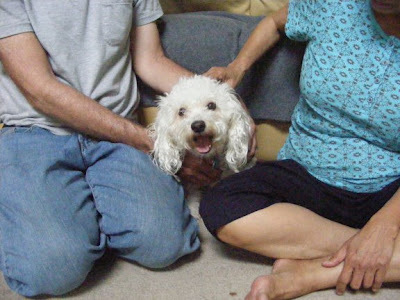 Your puppy is adorable~ Happy belated birthday to her!! The last is like a Kupie but cuter.. Very fun post! Looks like you are staying busy! I love you Blythe!! I have two of them, but hey are the reproduction dolls, not the originals. I hope your summer is going great. Happy Third Birthday, Ruby Roo! !